I hope my wire in answer to your letter of the 28th Oct.,The whereabouts of this letter are not known. just arrived, won’t be just what you didn’t want. It’s not a very easy question to answer. If you search your memory, you may remember that I spoke to you about this enamelGoldene Tafel. last winter, when we were together. Not long before, I had been told by a Bav. friend of mine, related to the house in question,The House of Wittelsbach, a German royal family from Bavaria. that it was for sale, and the price he mentioned was $70,000. That seemed to be decidedly too much.See also letter of September 25, 1934. Now, you mention 500,000 R.M. The question is, could you pay for it in some kind of blacked marks? If so, there might be a discount of some 40%. Even then, the price would be a thumping one. But if you had to pay at the official rate—and I have to do so when I buy books & pay for photos. in Germany nowadays, the rate is about 2.50 marks to the dollar, & the thing would cost $200,000!!! Of course, DreyThe firm of A. S. Drey was founded in Munich in the 1860s by Aaron S. Drey. The firm later expanded to London and New York. In New York, Aaron Drey’s grandson, Paul Drey (1885–1953), was a senior partner of the Paul Drey Gallery, founded in 1920. is planning to make a record rake-off in this deal. Now for the thing itself. We had it at the Byz. Show in Paris (see catalogueCharles Diehl, Jean Ebersolt, and Royall Tyler, Exposition internationale d’art byzantin, 28 mai–9 juillet 1931 (Paris: Musée des arts décoratifs, 1931), 145, no. 491.) in ‘31, so I know it intimately. It’s genuine, of course, and very important because of its size and provenance. I do not consider it of the first quality. I’ve had it under the quartz lamp,Royall Tyler believed that fake Byzantine enamels fluoresced when illuminated by a quartz lamp. and it reveals some small restorations—not enough to make any great difference. Looked at next to the Constantine Monomachos plaquesCrown of Constantine Monomachos, ca. 1042–1050, gold and cloisonné enamel, Magyar Nemzeti Muzeum, Budapest. from this place and the Esztergom crucifixion plaqueEsztergom Staurotheke, Byzantine, ca. 1150–1200, silver gilt and enamel, Cathedral Treasury, Esztergom, Hungary, acc. no. 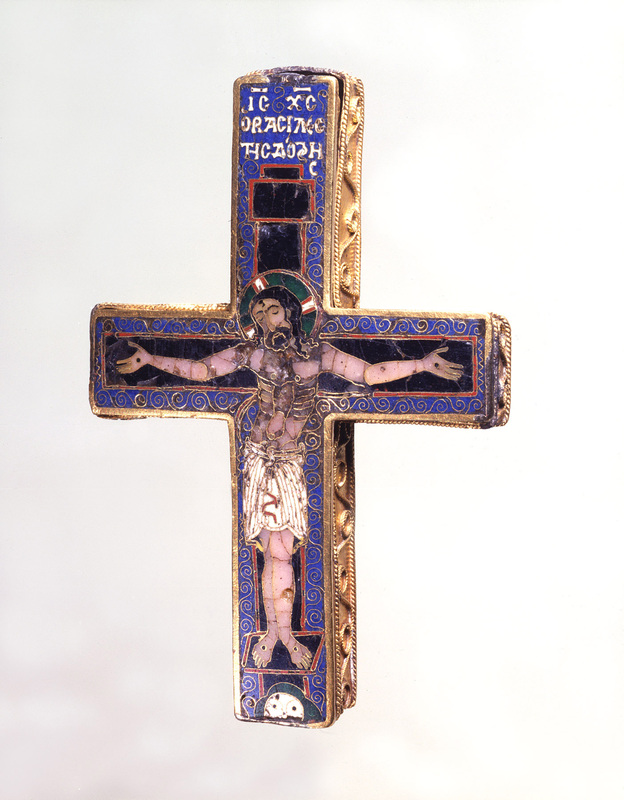 64.3.1. and the Cosenza cross,Reliquary cross, twelfth century, silver gilt and enamel, Cosenza Cathedral, Italy. which we also had in Paris,Charles Diehl, Jean Ebersolt, and Royall Tyler, Exposition internationale d’art byzantin, 28 mai–9 juillet 1931 (Paris: Musée des arts décoratifs, 1931), 149, no. 511. it takes a back seat. There are, in Soviet Russia (Gelati in the Caucasus) a lot of enamels, set into an iconostasis,Gelati, a monastic complex in western Georgia. The complex contains the church of the Virgin, founded in 1106, and the thirteenth-century churches of Saint George and Saint Nicholas. Royall Tyler may be referring to the Khakhuli triptych, a large repoussé triptych icon that incorporates over one hundred pieces of cloisonné enamel. The icon, formerly in the Gelati monastery, is now in the Art Museum of Georgia (Shalva Amiranashvili Museum of Fine Arts) in Tbilisi. which are finer. In Germany itself, there’s the Limburg stavrothekReliquary of the True Cross (Staurotheke), Byzantine, ca. 960, gold, gems, and enamel, Cathedral Museum, Limburg an der Lahn. (Cath. of Limburg an der Lahn) which is far finer. Ecclesiastical treasures have recently been sold in Germany, and others may be sold. I certainly wouldn’t advise bagging such a huge price for the Bav. plaque. If it were a matter of $50,000, then it might be considered. I’m making bold to tell you what my hunch is about its value to you. I’d be inclined to give Drey to understand that I wasn’t uninterested, but that the price was altogether preposterous. If Drey can get $200,000, or half that sum, from anyone in America for it, I shouldn’t, if I were you, lament the missed opportunity. I’d rather give $200,000 for the Limburg stavrothek than a quarter of that amount for the Bav. plaque. And who knows what may someday turn up? The drawing of the Goldene Tafel, as the thing is called, is just a bit perfunctory, and the setting of the cloisons is just short of that magic sensitiveness that makes the greatest enamels what they are. Well—it’s tempting. But the Basilewski cross,BZ.1936.20. which you already possess, is to my mind of decidedly finer quality, in spite of its small size, & I’d really rather own it than the Tafel. Hayford knows the Tafel well, too. Why not call him up & ask him what he thinks: 214 Cedar St., Bangor, Me? Another thing. The broochThis brooch is discussed and illustrated in Eric Maclagan, “768. Gefälschte Goldemail-Medaillons,” Mitteilungen des Museen-Verbandes als Manuskript für die Mitglieder gedruckt und ausgegeben im Juli 1938 (July 1938): 16–26, fig. 1. Maclagan believed this medallion to be a fake. of which a photo. is enclosed is being offered in London & Paris by a Dr. Ugo Bonessi, Villa Dolce, Pineta di Pescara.Dr. Ugo Bonessi (dates unknown), an Italian collector in Rome. Bonessi sent me this photo. The resemblance, both to your broochBZ.1933.5. See The Dark Ages: Loan Exhibition of Pagan and Christian Art in the Latin West and Byzantine East, February 20–March 21, 1937 (Worcester, Mass., 1937), 42, cat. no. 122. Marvin C. Ross doubted its authenticity: “Letter to the Editor of the Art Bulletin,” Art Bulletin 33, no. 1 (March 1951): 72. & to the Castellani broochAlessandro Castellani (1823–1883), an Italian jeweler and antiquities collector who had businesses in Paris, London, and Naples. The Castellani Brooch (Lombardic [? 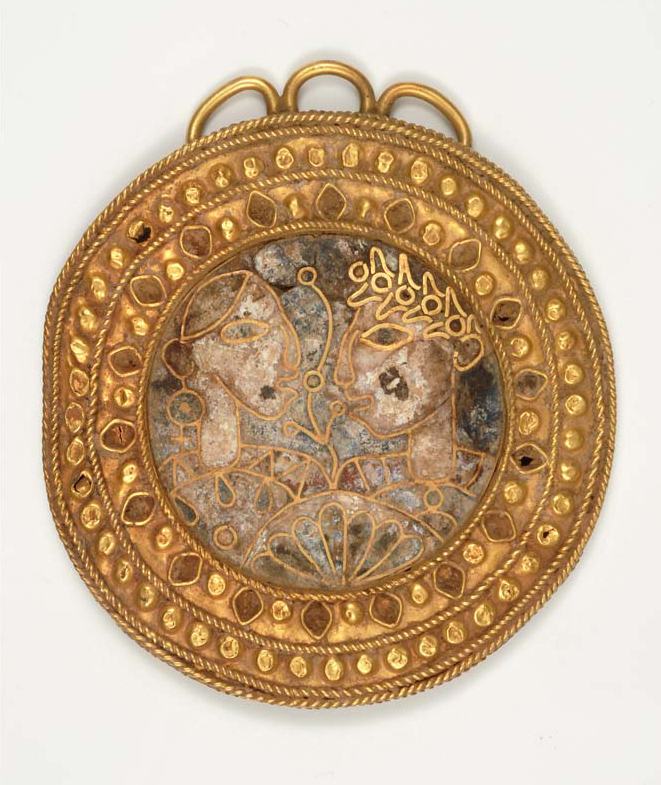 ], seventh–ninth century, gold and enamel) was acquired by the British Museum, London, from Castellani in 1865 (1865,0712.1). The brooch is in the form of a gold disc with a central roundel of cloisonné enamel representing a bust and with stylised cypress trees on each side. Around this is a border of cloisonné enamel flanked on either side by a circle of small rings with pearls between them. On the lower sides are three loops for pendants. See http://www.britishmuseum.org/research/collection_online/collection_object_details.aspx?objectId=84890&partId=1 (accessed October 5, 2015). in the Brit. Mus. is striking. I’ll try to see the object as soon as I can. I believe Bonessi started asking £2.500 & has gradually come down to £1000. The object looks all right, but it is somewhat troubling that another of this sort should turn up in Italy so soon after yours, and I certainly wouldn’t buy it until it has been very thoroughly examined. Have you ever had yours under the quartz lamp,Royall Tyler believed that fake Byzantine enamels fluoresced when illuminated by a quartz lamp. by the way, & what does it look like there? Does it fluoresce?In “768. Gefälschte Goldemail-Medaillons,” Mitteilungen des Museen-Verbandes als Manuskript für die Mitglieder gedruckt und ausgegeben im Juli 1938 (July 1938): 24, Eric Maclagan states that Royall Tyler reported that the Bliss medallion proved to be genuine under the quartz lamp. Of course, it’s resemblance to yours & the Castellani one doesn’t necessarily condemn it—but it does counsel caution. I know nothing whatever about Bonessi: he approached me because he got my name from Babelon,Ernest Charles François Babelon (1854–1924), director of the Cabinet des Médailles, Paris. of the Cab. des Médailles. I saw Volbach the other day in Rome. He greatly enjoyed his trip with you.See letter of March 27, 1936. Poor devil, he only gets Lire 800 a month, & the Vatican is so hard up that there’s no prospect of a rise. And it would be a thousand pities if he left Rome—he’s done wonderful work at the Vatican.